The Government Art Collection (GAC) invited non-political staff working in Number 10 to select artworks from the Collection, which have been on display at Number 10, for public exhibition in London, Birmingham and Belfast. You can see a slideshow with a selection of the chosen pieces on the Number 10 Flickr page. The volunteers provided the ideal group and thoroughly engaged with the process of making a public art exhibition from artworks that have been shown in 10 Downing Street over the years. Iconic and instantly recognisable, Number 10 is a complex space – a place of work, a domestic environment, a place of historical importance and a key location in international trade, diplomacy and politics. Works of art in Number 10 need to be accessible and engaging and add to the general ambiance of one of the most prestigious government buildings in the world. This is the first time that non-political staff from Number 10 have been involved in an art project of this kind. Most of those who volunteered have job titles that are instantly recognisable, for example personal assistants, facility managers and cleaners, while others are more unusual, such as the custodians who, while maintaining certain rules and traditions within the building also greet visitors at the famous front door. The volunteers all shared one thing – the desire to be part of an exhibition project that would place works or art previously or usually displayed at Number 10 in a public gallery. The group met several times across the period of a year, first at Number 10, then at the GAC offices and finally at the Whitechapel Gallery. 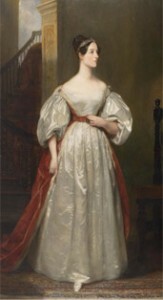 Highlights of the exhibition include a full-length portrait of Ada, Countess of Lovelace (1815-1852) Mathematician; Daughter of Lord Byron (1836), normally on display in the Pillared Drawing Room at Number 10. Other works of art with particular ties to Downing Street include a portrait of Robert Walpole, 1st Earl of Orford (1676-1745) Prime Minister (c.1740), and Samuel Scott’s view of Horse Guards Parade (1755). The group have also chosen Walter Richard Sickert’s The Sisters Lloyd (1888–89), an impressionistic depiction of two music hall performers, and Coast Scene with Rainbow (1952–53), a romantic narrative painting by Richard Eurich. Contemporary works by Seamus Nicolson, Wood & Harrison and Nick Waplington also form part of the display. Works will be disaplyed at the Whitechapel Gallery, London 3 June – 9 September 2012, Birmingham Museum and Art Gallery 17 November 2012 – 24 February 2013 and Ulster Museum, Belfast 15 March – 9 June 2013.